Led by Professors Su Ha and M. Grant Norton in the Voiland College of Engineering and Architecture, the researchers have published the results of their work in the May edition of Energy Technology. A second paper on using their fuel cell with gasoline has been accepted for publication in the Journal of Power Sources. 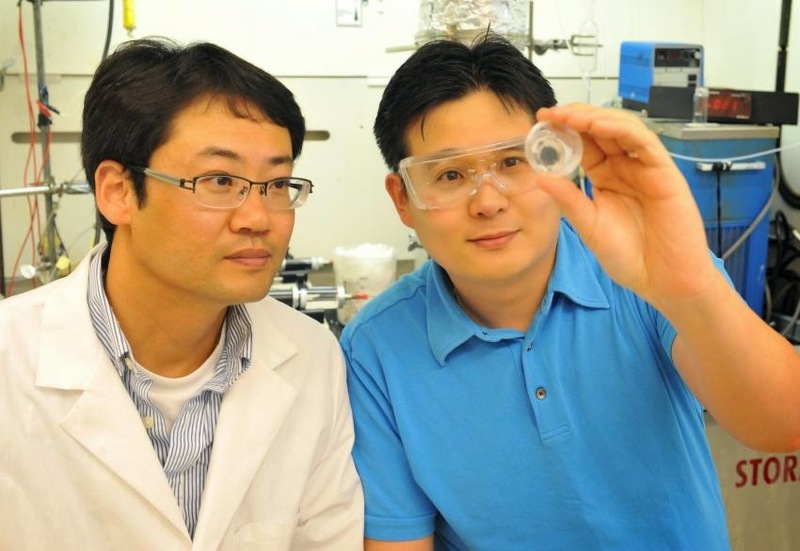 The researchers have made coin-sized fuel cells to prove the concept and plan to scale it up. About 10 years ago, the researchers began developing a solid-oxide fuel cell to provide electrical power on commercial airplanes. Fuel cells offer a clean and highly efficient way to convert the chemical energy in fuels into electrical energy. In addition to increasing fuel efficiency and reducing emissions of harmful pollutants, fuel cells are quiet and would be particularly helpful when a plane is at a gate and the main jet engines are turned off. A solid-oxide fuel cell is similar to a battery in that it has an anode, cathode, and electrolyte and creates electricity. But it uses fuel to create a continuous flow of electricity. The process could be approximately four times more efficient than a combustion engine because it is based on an electrochemical reaction. The solid-oxide fuel cell is different from other fuels cells in that it is made of solid materials, and the electricity is created by oxygen ions traveling through the fuel cell. Using jet fuel and gasoline to power their fuel cell proved tricky. To avoid the added weight of a device that converts the complex fuel into simpler components, such as hydrogen and carbon monoxide (a mixture called synthesis gas) the researchers wanted to be able to directly feed the liquid fuel into the fuel cell. Furthermore, they had to overcome the problems of sulfur poisoning and coking, a process in which a solid product is created from imperfect combustion. Sulfur is present in all fossil-based fuels and can quickly deactivate fuel cells. Using a unique catalyst material and a novel processing technique, Ha and Norton and collaborators at Kyung Hee University in South Korea and the Boeing Company in Seattle have produced a high-performance fuel cell that operates when directly fed with a jet fuel surrogate. "The results of this research are a key step in the integration of fuel cell technology in aviation and the development of the more electric airplane," said Joe Breit, associate technical fellow at Boeing and a participating researcher on the project. The researchers envision integrating their fuel cell with a battery to power auxiliary power units. These units are currently powered by gas turbines and operate lights, navigation systems and various other electrical systems. The two technologies complement each other's weaknesses, says Ha. The researchers also have used gasoline to power their fuel cell and envision someday using it to power cars. Vehicles powered in this way could use existing gas stations, rather than having to develop a hydrogen-based infrastructure.